Mark Sanford wanted to use part of $700 million to pay down "very sizable state debt"
WASHINGTON (CNN) -- The White House has rejected South Carolina Gov. Mark Sanford's request to use a portion of the state's allotted federal stimulus funds to pay off state debt instead of spending it on government services or programs. South Carolina Gov. 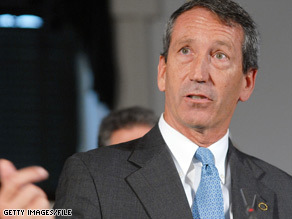 Mark Sanford asked to use some of his state's stimulus funds to pay off the state debt. Sanford is perhaps the most outspoken Republican opponent of the stimulus bill. He asked the president last week for a waiver that would have allowed South Carolina to use a quarter of the money -- $700 million -- to pay down "our very sizable state debt and contingent liabilities." In a Monday letter to Sanford that CNN's Jessica Yellin obtained, White House Budget Director Peter Orszag rejected the request. He wrote that the $48.6 billion allocated to the states must be used for education and public works projects. "Congress has not authorized the Executive Branch to waive any of the above statutory requirements governing the State Fiscal Stabilization Fund," Orszag wrote, saying he was writing at the president's request. Sanford's office responded to the rejection, saying it would draft another plan for the White House "which will more narrowly tailor our request to pay off debt in a way consistent with the administration's response. We believe there is a way to do so," said a statement from Joel Sawyer, communications director for Sanford. The governor has said that if the president does not grant the waiver request, he will reject the funds altogether. In an interview with CNN last week, Sanford said "spending money you don't have I think is a horrible idea." Sanford's position on the stimulus was the subject of a new ad by the Democratic National Committee. When asked to respond to charges by Democrats that he's using the stimulus debate to position himself for higher political office, Sanford responded, "If you don't want to debate the merits of the stimulus package itself, instead talk about motives." A response from Sanford's office to Orszag's letter said the "attack dogs from the DNC" should be called off. "It's time for the president's game of good cop, bad cop to end, and therefore we again ask him to end these ads so we can engage in a productive dialogue on the merits or our request," the statement said. The issue of whether to accept stimulus funds could next go before the South Carolina legislature, where lawmakers can vote to overrule their governor. Rep. James Clyburn, D-South Carolina, who last week called Sanford's decision not to accept the money "100 percent political posturing," said in a statement Monday his state's needs are numerous. "The American Recovery and Reinvestment Act provides sufficient flexibility for states to address those needs as they see fit," he said. "I hope the legislature will move forward with plans to draw down recovery funding to meet our needs."